It is probably around 500 years old, dating back to medieval times, and once was a Macdonald stronghold. Certainly an excellent position to control the area and any traffic passing through the Sound of Islay! I hope you enjoyed the views from this trip, I found it quite interesting to see Port Ellen and other places from much lower down than the views usually seen from the ferry. Under the new proposal, Mull and Jura could play vital roles acting as these “land bridges”, slash journey times and increase service frequency to Islay and the Outer Hebrides. Likewise, Islay passengers would get a ferry from Keills on the mainland and travel to Lagg on Jura, before crossing to Islay. One other advantage is that carbon emissions would be greatly reduced without the need for hybrid fuel ferries. I’m not entirely convinced. To start with I don’t see the single track roads leading to Keills on the mainland and on Jura from Lagg to Feolin Ferry coping with all the additional traffic. They would need to be widened, strengthened and regularly maintained, which I suspect will cost many many millions and take many years if not decades to achieve (if possible at all). I suspect the residents of Craighouse won’t be too happy suddenly having a main A-road going right through their village. Similarly the residents along the Crinan Canal and Tavvallich (I assume the mainland part of the route would go along there). Complete new ferry terminals where currently no infrastructure exists at all would have to be developed and built, also the one at Feolin Ferry would need expansion. While admittedly smaller than the current large Kennacraig to Islay ferry I would think a Keills to Lagg ferry still would need to be of a reasonable size to cope with the volumes and the conditions in the Sound of Jura. The current ferry over the Sound of Islay would probably need an upgrade as well to cope with the volumes required. That’s not to say the idea isn’t possible, I just feel it will be much more difficult than it seems at first glance. What do you think, will this happen, should this happen? In February 1968, the Government rejected the Overland Route on grounds of cost. As well as new ferries, it would have involved upgrading more than 30 miles (50km) of single track roads to Keills and on Jura at an overall cost of £3.2m. Instead, the Government preferred to spend £1.1m on a new ro-ro car ferry to operate from a new pier at Escart Bay, about a mile down the loch from WTP. This would serve Port Askaig, Colonsay and Port Ellen. Jura would be served by a new ferry across the Sound of Islay to Feolin instead of the traditional call at Craighouse en route to Port Askaig and Gigha would have its own independent ferry. This option could also be delivered much more quickly than the Overland Route and within the predicted remaining life of the Lochiel. Something a bit different today. Something slightly unexpected. There’s quite a bit of talk about ‘YouTubers’ these days, how they become successful, that a lot of young people have aspirations to become a famous ‘YouTuber’ and more. In any case, it’s hard work, very hard work (and probably a bit of luck) to achieve that goal. I don’t follow many of them (among other things because I have very little to no interest in video gaming or gossip or fashion, which many of them seem to cover). One of the few I do follow and watch quite regularly is Tom Scott (website, YouTube channel). He covers a variety of interesting things incl his probably most popular series ‘Things You Might Not Know’. So what does all this have to do with Islay and Jura? Well, earlier this week Tom started a three part series titled ‘How To Be Popular On The Internet’ (Part 1, part 2). Watching part 1 the start is on a rainy Scottish island. Somehow (don’t ask me how, it was just a hunch) I had a feeling I knew this place. So I did some digging. Looking at this picture on his Instagram account I became even more convinced he would end up on Jura with a view over the Sound of Islay and Caol Ila in the distance. But what would this have to do with ‘How To Be Popular On The Internet’? George Orwell’s 1984 came to mind, but didn’t really make sense. Then I thought of the KLF, their book ‘The Manual’ and that they burned £1,000,000 on Jura. Which kind of made sense for this series. I don’t know if Tom only visited Jura for long enough to film the video or if he also learned more about Jura (and Islay) while he was there. I should think there are a number of things he could use for his ‘Things You Might Not Know’ series, like the Corryvreckan whirlpool (once considered unnavigable) or the Round Church in Bowmore (to my knowledge there are only a handful of round churches in the UK). Unfortunately the wave power station on the Rhinns of Islay is now gone, I think he would have found that quite interesting. I hope you’ve enjoyed the videos from across Islay and Jura. For more and where to bid for the pillaged whisky see The Great Islay Swim. 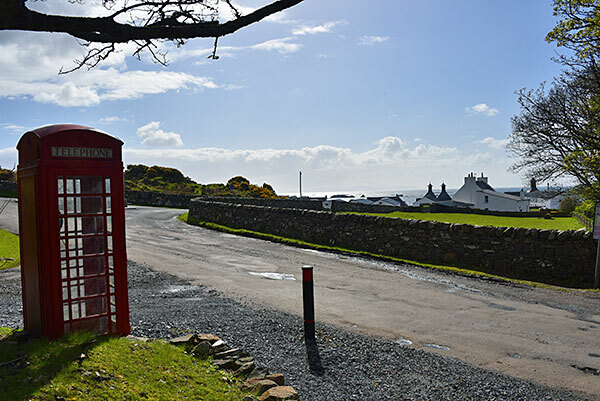 In April I went to Islay for the Islay walking week and more. For various reasons I haven’t got round to write about the week so far, better get my act together now. As hoped it turned out a great week, even the weather largely held up. But back to the walking: As mentioned I went on to three walks, the opening walk on the Oa, the long walk out to Bholsa and the excursion to Jura. I had considered going to Colonsay and Oronsay, but having been so many times already I changed my mind and in the event the ferry was cancelled that day anyway. The walk on the Oa was beautiful, the weather turned out better than expected and the Sun came out for the most important part of the walk along the steep cliffs (a very heavy rain shower arrived just as we got back to the road and were arranging transport back to the cars, couldn’t have timed it much better). While it was hazy for most of the time the views were impressive. It even cleared up for a short time and we could see over to Ireland. 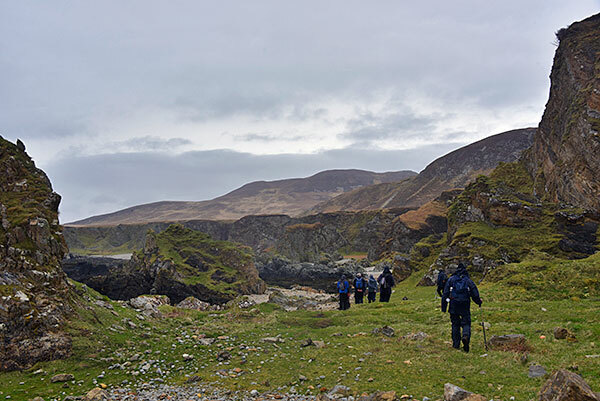 The walk to Bholsa in the far north of Islay was educational, as it was led by geologist and book author David Webster. He explained how the landscape had formed, where the rock formations came from and much more. Some of the rocks are of volcanic origin, were once 1,800°C hot and located in what’s Iceland today (hope I remembered that correctly). 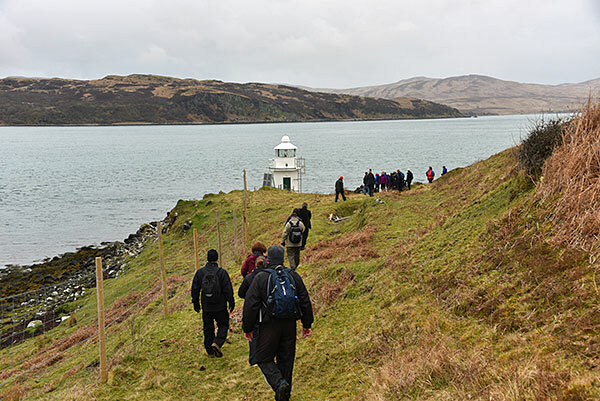 The last day took us over the Sound of Islay to Jura for a walk north along the shore. From Carragh an t-Sruith lighthouse we looked over to the construction site of the future Ardnahoe distillery. Unfortunately some quite heavy rain set in soon after we left the lighthouse after lunch, ruining some of the best photo opportunities. I’ll have to revisit this during my next visit. Luckily the rain stopped and by the time we returned to Port Askaig the Sun had come out and we could sit out in the garden for an after walk drink and look back at a great week. On my non-walking days I was busy with a variety of other activities, including catching up with friends, visiting Bruichladdich and Laphroaig distilleries, visiting Islay Ales brewery, trying out the new Peatzeria pizzeria, walking on the beach in Machir Bay as well as Saligo Bay and birdwatching at Gruinart. In summary, a great week! 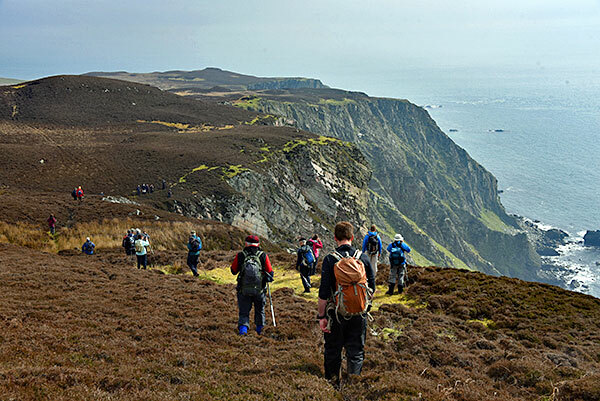 Looking forward to both my next Islay visit in June as well as the Islay walking week 2018. I’m pretty sure any Calmac ferries fan will love this video. Very interesting to see it from this angle, especially as I thought only parts of the stern remain now. I might be wrong, but it looks to me as if there might be something left of the bow hiding below the water (visible towards the end of the video when he’s flying above it looking down)? What do you think? That is all, I’m afraid.